Marilyn Hickey Ministries is sending a clear message of love, hope and healing to people around the world through Bible teaching, international healing meetings, group ministry tours, pastors’ and leaders’ conferences, humanitarian efforts, and the daily television program, Today with Marilyn and Sarah. Whether Marilyn and Sarah are traveling domestically or internationally, they are seeing lives literally changed by God and His Word. We’ve traveled to over 137 countries, hosted 55 group tours, and more than 40 International Meetings, with more every year. In 2016, we held Pakistan’s largest religious gathering ever: 1.1 million attended, and thousands gave their lives to Christ. Sent tents, water, and blankets to Pakistani earthquake survivors. Held healing meetings in Sudan: over a three-night period 160,000 attended, 40,000 responded to give their lives to Christ. Built water wells in Ethiopia, and bomb shelters in Sderot, Israel. Funded a community center in Indonesia following the Tsunami. Our TV and media ministry reaches around the world through the internet and live-streaming. Marilyn and Sarah live out their great desire to help unite people. Where there is need, there is a call to respond. With true Christian humanitarian hearts, Marilyn, Sarah, and Marilyn Hickey Ministry partners have helped millions of individuals overcome setbacks and live the Bible. 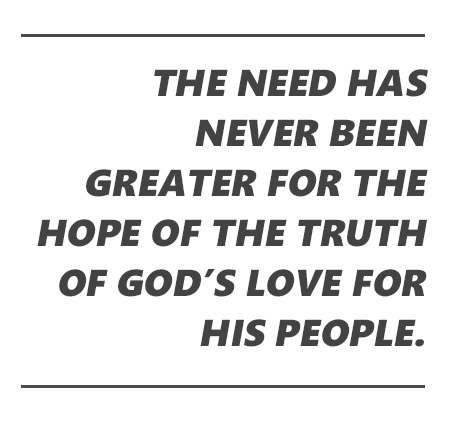 The need has never been greater for the hope of the truth of God’s love for His people. Thank you for caring enough to learn more about our work.